There wasn’t much we could do about last winter, except for minimizing the impact of flooding. To this end we will continue to focus on means to improve edge management by working with local municipalities. The role of wetlands on the landscape cannot be stated enough either. The wetlands and the associated cattail stands and riparian zones act as sponges in controlling flooding and provides excellent thermal cover for wintering upland birds. Trespass grazing of ditches and right of ways is rampant in many areas of southern Alberta. This infrastructure is important for flood and drought management, filtration, pollinator success and biodiversity, not the least of which are upland game birds that depend on this edge effect. Other issues that we will continue to focus on is proper placement of green infrastructure, which is code for keeping wind mills and solar panels off of our native grass. Grassland conversion continues to be an issue, which is a concern as native grass is the rarest ecotype in north America – there is about 2% of it left. The sale of crown land seems to be the enabler on this front and it is seemingly happening and an increased pace in a not so public manner. Our on the ground habitat work moving forward will continue to focus on securing land for perpetuity. The Chinook purchase we were part of last year is a real gem and possesses some of the very best pheasant habitat we have in southern Alberta. I managed one field trip out there during the last week of November and we managed to take the largest wild rooster of the year – a 40 bar beauty that ended up to be the biggest rooster ever harvested by long-time supporter Tom Spoletini. Water quality issues will continue to lead conservation enhancement efforts in southern Alberta. The success of the Milk River Ridge Reservoir Water Quality Initiative has led to other jurisdictions to take note. Plans are under way to work with a major irrigation district to examine the health of the riparian habitat on all existing reservoirs, water bodies, ditches and canals. 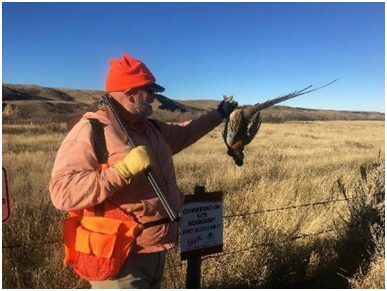 This will provide an excellent opportunity to leverage funds from various pots of money that in the end will greatly benefit wild upland gamebirds. Pheasant hunter numbers are up once again, helping Alberta celebrate the fact that we are the only jurisdiction in north America where hunter numbers are not in decline. Hunter numbers historically have tracked population trends. So, to see an increase in pheasant hunter tags in a year like we had is pretty incredible. I would be remiss to not acknowledge the professional and excellent manner that the Alberta Conservation Association is doing in managing the pheasant release program. There is little question that this program has some reflection on the pheasant hunter number trends.